The National Coordinator of the Nigeria Customs Strike Force, Abdullahi Kirawa, has revealed that his team has seized illicit drugs worth N43.1m in Niger state. Kirawa said this at a news conference in Minna on Thursday. 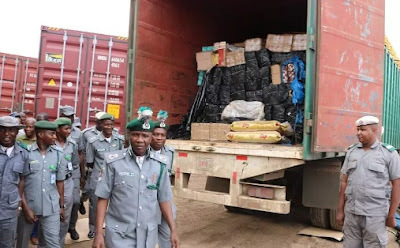 He stated that a truck conveying the drugs was intercepted along the Suleja-Minna Road on its way from Kogi State and heading for Kontagora in Kebbi State. According to him, the seized items include 1,926 packets of 200mg Tramadol; 2,190 packets of 225mg Tramadol Royal; and 218 packets of 50mg Penkidol. He noted that the Tramadol was above the limit allowed by law, adding that the suspects had been released on administrative bail, while an investigation was ongoing to apprehend the owner of the consignment. Kirawa also stated that the strike force team seized 733 bags of foreign parboiled rice valued at N11.5m; 330 pieces of used tyres; 18 bales of second-hand clothing worth N648,000; a second-hand J5 bus with duty paid value of N1.3m; and a Pontiac Vice with duty paid value of N648,000. The item, according to him, have a total value of N61,459,500.